Berlin – At this year's METEC-THERMPROCESS exhibition, infrared temperature measurement experts Raytek and Ircon (Hall 9, Stand B73) will present their comprehensive pyrometer program for the metal working industry. By detecting infrared radiation from a distance to determine an object's temperature, pyrometers reliably monitor products and processes with temperatures up to 3,000 °C. Exhibition highlights range from robust handheld devices to fixed pyrometers with rugged accessories, from OEM sensors with record-setting compact dimensions to highly precise thermal imaging systems. The team will be happy to advise visitors on the best way to tackle their particular application. Raytek and Ircon provide capable solutions for all scenarios involving digital or analog signals and automation environments featuring a variety of different fieldbuses or Industrial Ethernet protocols. The latest addition to the product family, Raynger® 3i Plus handheld infrared thermometers are designed for highly demanding hot environments, measuring temperatures up to 3,000 °C. A high optical resolution allows for accurate temperature readings from longer distances. A heat-resistant "Red Nose" warning detector ensures operator safety and efficiency. 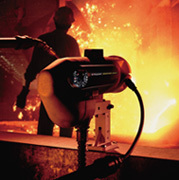 Dual laser and scope sighting, visible even against red-hot backgrounds, make this infrared thermometer a perfect choice for primary and secondary metals processes. A wide range of spot pyrometers for fixed installation includes one and two-color (ratio) pyrometers as well as fiber-optic models suitable for extreme industrial environments. Installation in remote or hard to reach places is not a problem since the accompanying software allows for PC-based sensor configuration. Integrated automatic self-diagnosis functions ensure consistent accuracy. Through-the-lens, laser, and/or video sighting facilitate orientation. Motorized focus control enables remote sensor re-focusing. Cooling accessories open up applications in ambient temperatures up to +315 °C. 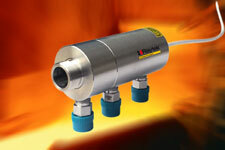 The Raytek MI3 line includes the world's smallest stand-alone pyrometer, 28 mm long and 14 mmwide. MI3 sensors are capable of withstanding ambient temperatures up to +180 °C without cooling. Two shortwave models accurately measure reflective surfaces and are therefore better suited for metal sheet processing than longwave infrared sensors. MI3 sensors are also available with ATEX and IECEx certificates for use in potentially hazardous areas. Raytek and Ircon line scanning systems generate thermal images of live processes for continuous or batch production as well as for discrete manufacturing. The systems have a wide 90° field of view. Featuring built-in laser sighting, water-cooling, and an air purge housing, they withstand even the most demanding conditions. With a maximum optical resolution of 200:1, a scan speed of up to 150 lines per second, and up to 1,024 measurement points per line, they are among the most precise and fastest thermal imaging systems in the market. Even minimal temperature anomalies and hot spots are detected and displayed in real time. Berlin -Expanding its MI3 series of compact infrared temperature sensors, Raytek introduces the MI3LTH pyrometer for operation in high ambient temperatures without cooling. The sensing head withstands up to +180 °C as it is separated from the electronics. This widens the range of applications for the non-contact systems, enabling, for instance, direct replacement of contact probes measuring temperatures up to 1,000 °C. Moreover, the good thermal protection also allows for cost-efficient solutions where cooling accessories or cooling water cannot be used due to a lack of space or a high explosion risk. The new MI3LTH sensor has of course all the benefits of the MI3 series: small size, plug-and-play capability, compatibility with the full range of digital communication boxes, optionally with Modbus and Profibus interfaces, or an analog communication box with four galvanically isolated analog outputs. The modular MI3 system provides very cost-efficient solutions especially for applications with multiple measuring points since the communication boxes serve up to eight sensors. The introduction of the new MI3LTH sensor completes the digital MI3 series as a follow-up to the successful analog MI series. Possible applications include industrial ovens and dryers, laundries, and the textile industry. Industrial OEMs will find it a versatile, easy-to-integrate temperature measurement solution.